Beauty Magazine wordpress template is a nice pink somewhat girly WP design. 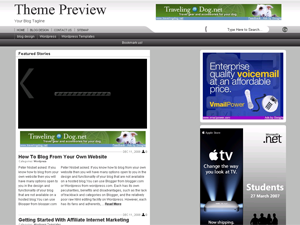 It is geared towards advertizing as there are quite a few ad space placeholders. Four are located just below the header – each of them accepts a small snippet of text and an image. 4 advertisment banners are placed on the right sidebar (the first of two) in dimensions 125 x 125 pixels. The header features a pink silhuette graphic of a woman. This entire wordpress skin is a mixutre of shades of pink. Everything is either pinkish or white. Top of the main content area shows the latest article, below it are excerpts of the previous posts two by two per each column. 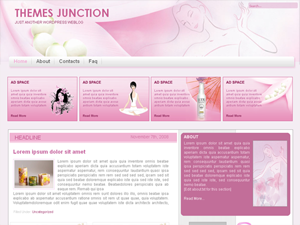 Beauty Magazine wordpress theme was designed by Themes Junction. Alpha wordpress theme is a clean and simple – pure css wp design. 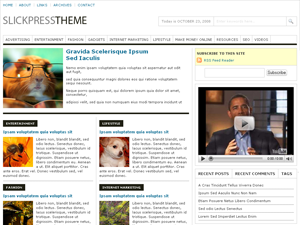 This is a magazine type wordpress template which is mostly white and has 4 columns. Pages menu is just below the header, followed by featured news section (your latest blog entry title and short excerpt). On the right side there is a list of “popular articles” – latest posts. Further down we have two columns of latest post snippets, and on the right of them are four placeholders for 125 x 125 pixels advertising banners. Below that, in the sidebar there is a youtube video place holder, followed by two columns of sidebar elements. Alpha news wordpress template was designed by ChiQ. 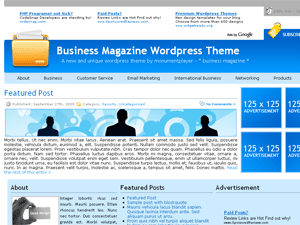 Massive News wordpress theme is best suited for a magazine type blog. This wp template is full of placeholders for advertisment banners so you can easily edit and put in your own. Massive News wordpress template comes with some plugins included so make sure you put them in your blog’s plugin directory and activate. Different Files have been created to make changing ads through FTP userfriendly. All the files can be found in MassiveNews –> ads. Place your ad codes between the opening and closing Div Tags. Go to Wp-Admin–>Users–>Profile. Upload Image and add Profile details in biography. Go to Wp-Admin–>Users–>Profile. At the end of the page there are boxes for every Author to enter his/her Ad Codes. 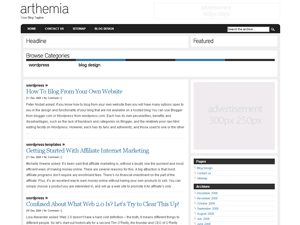 Arthemia wordpress template is a clean and minimalistic wp skin. It is mostly white, with black header which includes pages links. The blog’s search function is located in the top right corner. Main content area is on the left side, while the wp theme’s only sidebar is on the right. The sidebar is widgets enabled. Footer also contains the recent comments, recent posts and a spare possition for whatever you want to put there. 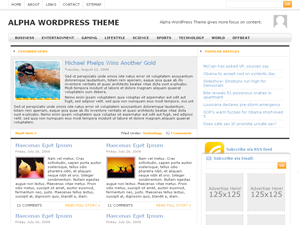 Arthemia wordpress theme was designed by Michael Jubel.